Thursday night: A few showers, northern New England freezing rain. Lows in the 30s. 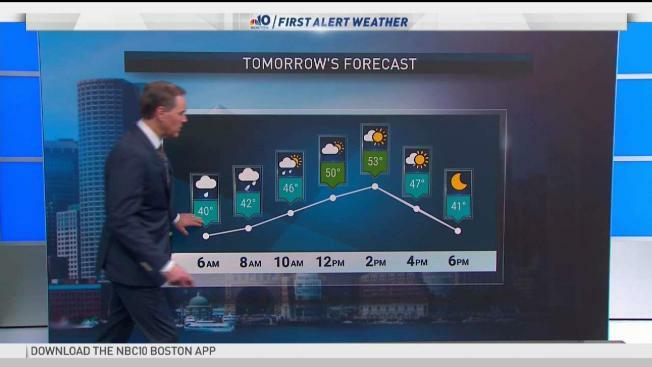 Friday: A period of AM showers, then some sun. Highs in the 50s. Scattered rain returns to the forecast Thursday night. There is a chance that northern New England will see a brief shot of freezing rain and sleet before changing to rain as temperatures rise mid-morning Friday. A warm front lifts north Friday morning as a low pressure center passes to the northwest of New England Friday afternoon. Scattered rain continues to move through Friday morning, quickly pushing offshore by noon. Then the cold front will usher in colder temps and drier air for the weekend. Highs jump into the low to mid 50s for a short time Friday afternoon before the wind changes direction. The northwest wind picks up Friday evening to gusts between 30 and 40 mph inland, 40-50 mph on the coast. There could be isolated outages and pockets of damage. The worst of the wind will be Friday night into Saturday morning. The wind relaxes by Saturday evening. Saturday's highs will be in the upper 20s with mostly sunny skies. There may be a couple snow showers across the mountains Saturday morning. Sunday will be mostly sunny with increasing afternoon clouds. What's Up With These Temperature Swings? Sunday into Monday a low pressure system tracks south of us. It may trigger a couple light snow showers that could give us light dustings into the start of the work week. Highs all next week will be in the 30s. The milder day looks to be on Wednesday as we reach near 40. Otherwise, it will be a very seasonable February week. As for snow chances, we have one light chance Monday morning. A bigger system tracks across the Midwest early in the week and arrives in the northeast Tuesday into Wednesday. The track may be in such a way that our area is divided similar to what we have had all winter — snow in the north, mix in central and rain in southern New England. We will watch this one closely, as it is our best chance for snow in Boston in the next 10 days. The next weekend may bring another kitchen-sink storm Saturday and/or Sunday.